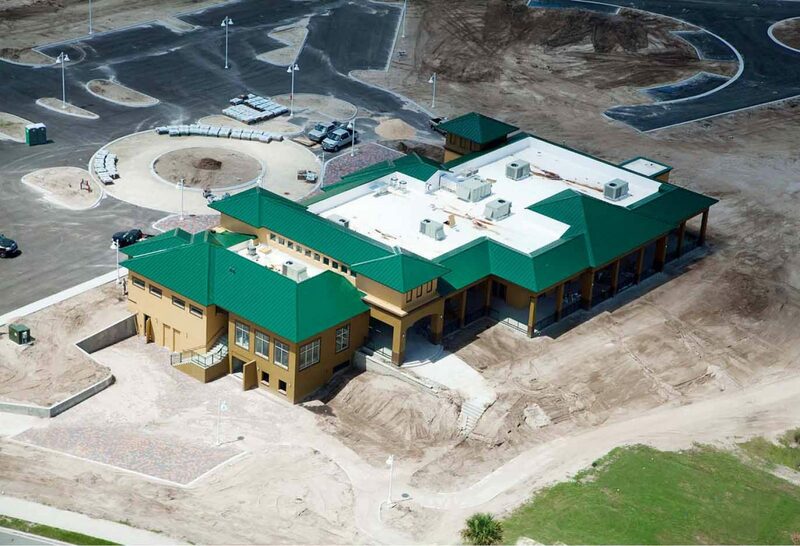 Situation > Olen Development, the owner of this property, contracted with T&G Constructors, to complete this two-phased project, which began with the ground up construction of a golf course clubhouse core & shell. This work was in preparation for a future 16 building, multifamily residential complex. Phase II of the project was the interior build-out of the clubhouse, which included a commercial kitchen, restaurant, two bars, concession area, pro shop, men’s/women’s locker rooms and rest rooms. Action > T&G was tasked with building a cart barn in a partial basement format, which was difficult due to the high water table on this site – the project is only 2.5 miles from the east coast and the Atlantic Ocean. Two retention ponds were also required, and 10 feet of dirt fill was moved in order to build this project site to grade. Results > Though this project was new construction, it was built adjacent to the existing (occupied) golf course and immediately next to active golf car paths. T&G Constructors performed the work while these operations continued without disruption or impact to the guests.